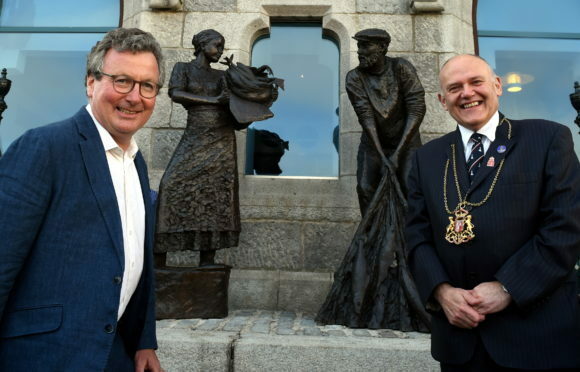 Last night Lord Provost Barney Crockett unveiled the bronze sculptures of a fisherman hauling a net beside a woman holding a creel outside the city’s Maritime Museum. The Shiprow site was chosen because records from the 1100s show it was home to the city’s first wooden harbour. The creation of such a memorial was first tabled several years ago and the cause gathered momentum following the creation of a petition by Robin Youngman in 2016. Last night the former trawlerman from Boddam stood beside the Lord Provost to watch the unveiling and said: “It was a very emotional moment for me and the trawlermen that are left. “It’s been a long time coming but at least we now have a focal point where people can come and reflect. “This is the closest a lot of people will get to having a gravestone, as their bodies were lost at sea. The Lord Provost said: “Aberdeen is a city that always lives with one foot on the seabed and, in particular, our fishing industry has been the basis for everything we’ve achieved as a city. He added: “It’s so intimate for the people of Aberdeen as it’s their key memory and the key heritage that we have. The statues were created by Oxfordshire sculptor David Williams-Ellis, who chose a man and a woman to show that the people who stayed at home on dry land were just as integral to the fishing industry to those who spent time at sea. The artist said: “When I was making the sculptures I learned how important it was for the people of Aberdeen.